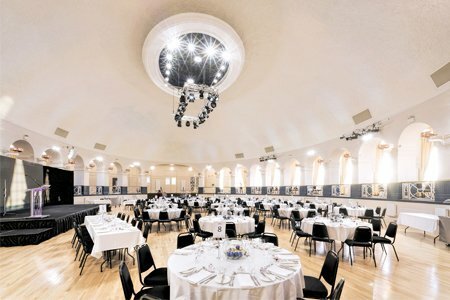 The sheer size of the project, determined that acoustic treatment not only had to be applied to the ceiling in certain areas, but due to the height of the ceiling, the walls also needed treatment to prevent sound polarisation. 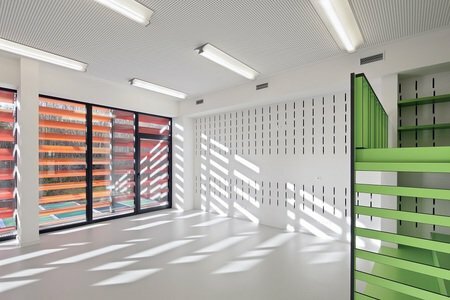 Two very different products were used to control the schools’ acoustics. 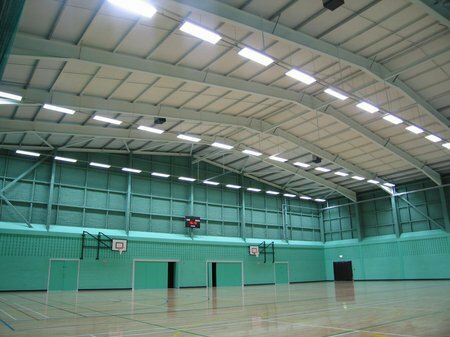 SonaSpray K-13 acoustic decorative finish in white was applied to the centre area of the corrugated steel ceiling, SonaSpray K-13 in green was applied to the upper section of the steel clad walls, and SoundBlox were used at low level. 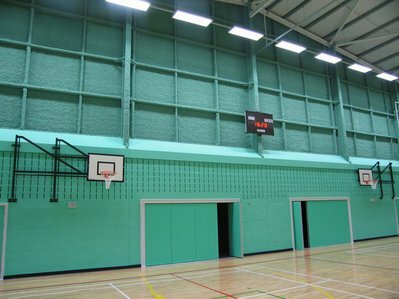 SoundBlox building acoustic sound blocks are the perfect product for controlling school sports hall acoustics at low frequency. They absorb both direct and reflected sound by using Helmholtz resonator principles. The selection of Sound Blocks along with the use of absorptive cavity fillers for high frequency attenuation enabled Oscar Acoustics to adjust absorption characteristics to suit the requirement. They are also designed to be laid along with standard masonry blocks and can create complete walls or attractive contrasting panel effects. Once installed, SoundBlox are resistant to impact damage and require virtually no maintenance.